The Partnership aims to develop a series of Hazard Impact Models (HIMs), as the basis to establish a world-leading natural hazard impact forecasting service. Hazard Impact Models combine data and expertise from Partners to identify the impact on populations, areas and assets from a range of natural hazards. These impacts could include loss of life, the scale of damage or disruption, numbers of people impacted and economic loss. This requires cross-agency development of a model that can reflect a changing situation over time and is capable of being sensitive to the vulnerability of different types of infrastructure, and people, to hazards. This would include impacts on the road and rail network, agriculture and the general population. “A dangerous phenomenon, substance, human activity or condition that may cause loss of life, injury or other health impacts, property damage, loss of livelihoods and services, social and economic disruption, or environmental damage” (UNISDR, 2009). We focus on hazards that result from natural causes rather than industrial accidents or malicious attacks. These include flooding, landslides and extreme weather. We measure the impacts of natural hazards through analysis of the interaction between the hazard and receptors. Receptors are the people, properties, infrastructure or environment that may be harmed as a result of interaction with the hazard. Different hazards affect different receptors to different extents, so the first challenge is identifying the key receptors and the impacts they may experience. To standardise impacts we are developing a classification of impacts (below). 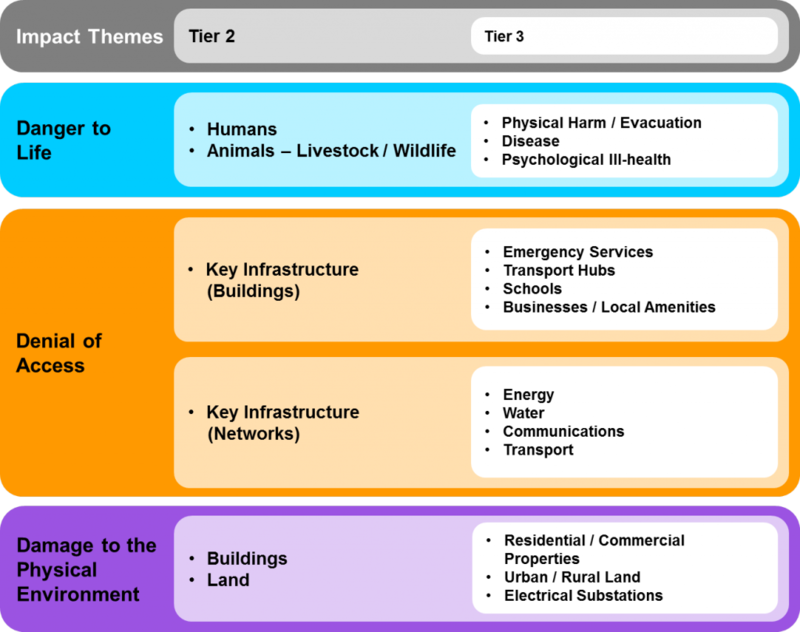 These characterise impacts into broad themes which can then be broken down into more specific impacts if necessary. The main themes are Danger to Life, Denial of Access and Damage to the Physical Environment. By using this classification, we can tailor impacts to the specific needs of users, while still being able to refer back to common themes. Additional tiers and impacts can be added to include new impacts. The Hazard Impact Models (HIMs) estimate the risks that arise from the relationships between the extent and magnitude of the hazard, the exposure of the public, infrastructure and environment, and their respective vulnerabilities. The Hazard Impact Framework (HIF) provides guidance to ensure that Hazard Impact Models are created to the same standard. This means that in the future, we can put our models together to develop our understanding of the relationships between hazards. A key element of the HIF is the use of standardised interfaces for model outputs. This means that in the future, we can combine our models into a virtual Hazard Impact Production System (HIPS). This will enhance both our understanding of the relationships between hazards and our ability to predict the impacts that arise from multiple hazards. Who will use Hazard Impact Model results? End users need model outputs to assist in their distribution of guidance and warnings to emergency services and supporting organisations in the event of an emergency. The end users are scientific experts and will be able to interpret model outputs to produce clear and accessible advice to wide audiences. Research users need access to model outputs as well as access to methodology and background information. 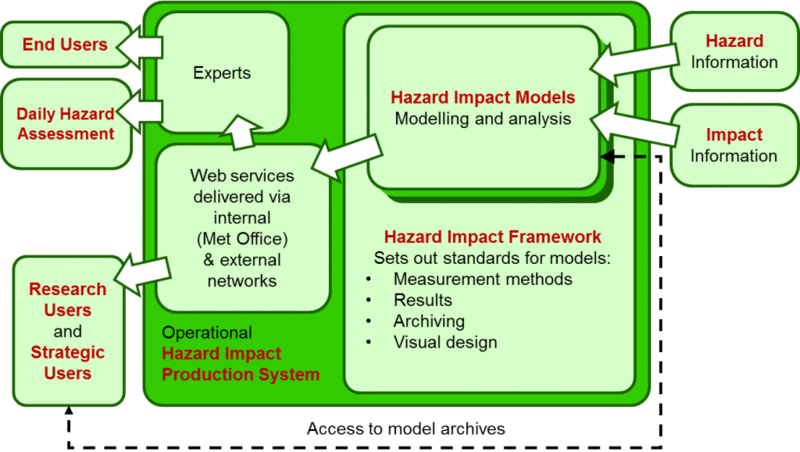 Research users will use this information to develop the science behind individual Hazard Impact Models. This information will also be used to build methods for joining models together to better understand how we are impacted by multiple hazards. Strategic users typically hold key positions in central government. These people need access to Hazard Impact Model outputs to inform immediate decision-making in the event of an emergency. They may also use model outputs to provide evidence for longer-term policy-making to increase future preparedness and resilience.